When it comes to promotional flags, there are many different directions the wind may take you to help your business or organisation stand out. Whether you are considering feather flags, advertising flags or custom flags, you will find a variety of choices designed to grab the attention of passersby. According to Mark Thompson of Print Designs, a leading print and display companies in the UK, there are lots of things to love about using promotional flags. These outdoor flags are high-impact advertising tools that keep your company name in front of potential buyers, while enhancing overall brand recognition. In addition, the flags can be used for nearly any industry looking for cost-effective outdoor advertising. Advertising flags are ideal for attracting attention for brick-and-mortar stores and corporate centers, as well as at special events and tradeshows. 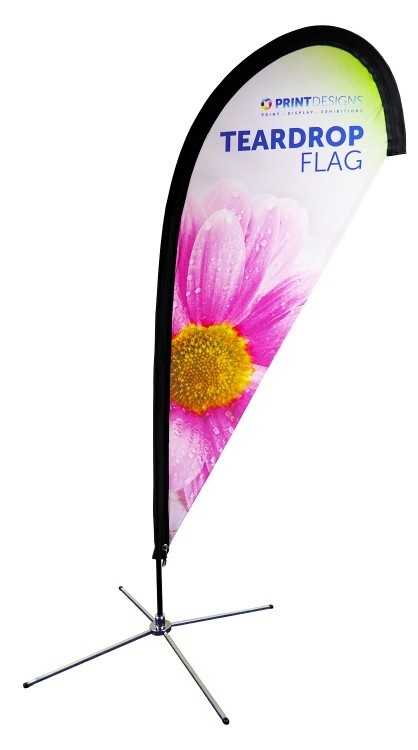 Here are ways businesses can benefit from using promotional flags. Following are flag options that are available to promote your business. Feather flags, as the name implies, are lightweight and durable – without compromising quality. They are easily portable and quick to install anywhere. These promotional flags come with both single- and double-sided print options, allowing you to decide if you want your message to be viewable from both directions. You can also have different messages on each side, as well as other customisation options. Feather flags are attached to glass fibre poles and feature full-colour graphics of your choice. Many include a handy carrying bag to make them easy to transport to new locations. When purchasing your flaYou can also choose the type of base you want for your flag, which can determine how long it will last. This choice often depends on the type of terrain you have for installation, as well as expected weather conditions including the potential for frequent wind and rain. Teardrop flags are also known as flying banners. These advertising flags, like their feather-flag counterparts, feature full-colour graphics that are designed to deliver your brand message and catch the attention of all who pass by. They also attach to the same type of high quality, lightweight poles made from glass fibre. The primary distinction between feather and teardrop flags is their shape. While feather options have a straight-lined bottom, the teardrop flags are aptly named in that they more closely resemble the shape of a teardrop. Teardrop flags can be printed either single- or double-sided and displayed in a variety of different landscapes. They also come with your choice of base to accommodate your needs. If you are struggling to find a flag option that fits your needs, you can opt to work with your promotional flag company and have a custom flag made. Like teardrop and feather flags, custom flags feature the same striking imagery and graphics that can turn heads and grab the attention of potential customers. Promotional flags are most often made from woven polyester, a durable fabric that can be manipulated and printed in a multitude of ways. Using this fabric results in striking visuals that remain colourful and strong for extended periods of time. Woven polyester is machine washable on the gentle setting. This way, if your flags are left outside in harsh weather conditions and get dirty, they can be easily machine washed and cleaned to like-new condition. The woven polyester is printed using a process called dye sublimation. This refers to a technique in which heat is applied to transfer ink onto the material, producing vibrant, durable graphics that stand the test of time. If you think your business can benefit from advertising flags, first check ordinances and laws in the area where you want to place and install your flag or flags to ensure there are no restrictions. Different areas have different requirements on the positioning or utilization of flags, banners, signs, and other promotional products. This does not tend to be an issue in most locations, but it is important to check before proceeding.